I present the complete and illustrated recipe for: A Piece of Me. Why anyone would want to get a piece of me for themselves, is a “moo” point as Joey would say! Regardless, you should note that while this recipe is for a whole cake, you should ideally restrict yourself to one piece, whether you are diabetic or not! This recipe is suitable for diabetics, non-diabetics, and non-judgemental people everywhere! 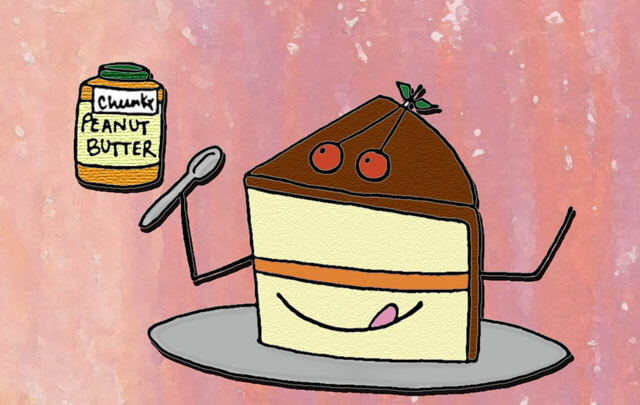 Play instrumental or dance music, light lemon incense, open a bottle of peanut butter, share some secrets and your “Piece of Me” will be one content piece of cake! I created this “recipe” to take part in the Weekly Writing Challenge: A Pinch of You. It was a weird venture trying to describe myself. I felt somewhat self conscious: like I ought to be coy about something. We don’t get to do this kind of Know Thyself in the normal course of our lives – so it’s a revelation to see what we think of ourselves. That’s what made this such an interesting and enlightening challenge! The first Food Blog i liked 🙂 specially this post. It is amazing how words can make you smile instantly 🙂 though your Blog title is sugar free sweet heart but your personality seems like a sweet sweet sugar. We are here to share and spend good time with each other, Its my pleasure Priya. Left me in stitches. Great read! Thanks for posting this, keep posting. I had lots of fun reading this- cleverly designed and it made me smile all the way through! hahahahhaha! I loved this post so much! You describe yourself really well, I think! This is a really clever way of defining a piece of you! I love it! “Pour surprises in–no peeking:” That line was whimsical perfection. And I can’t tell you how happy it makes me that you suggested enjoying this with an open bottle of peanut butter. Good show! Heh heh! To be honest I was pretty pleased with that line myself! 😀 And of course peanut butter rocks! So cool! Really creative- love it. That sounds like a nice recipe. I doubt anyone would want a piece of me; it would be way too tough! Interesting post. The beauty of the way this works is that some people would actually prefer “tough”! Thanks for stopping by! really fun! 🙂 enjoyed this so much! I “Liked” for the Friends reference, I stayed for the creative recipe. Well done! Thanks Zoe! I find these references popping into mind once in a while even though it’s been a while since the last time I watched Friends. I guess some of it stays on like well-learned vocabulary! OMG, that is the sweetest DP ever!!! Keep up the great work! Aww, thanks Erisa! You have an interesting blog, and it’s about the same “age” as mine! Good luck! extremely creative description of you….great post…speaks much…congratulations on being freshly pressed. Aw I love the illustration and this is a well thought out piece too! Thanks! I just checked and wow you’re an experienced blogger! I wonder what I’ll be talking about 3-4 years down the road! Thanks for looking at my site. Blogging is a hit or miss for me in the summer. Winter seems to offer me more time to write. Keep blogging. You’re doing a wonderful job! Unique recipe to make a unique person. Nice unique post. We’re all unique right? 🙂 Thanks Kaye. I will have to try this out. Love your art with this delightful piece. Looking forward to seeing more from you! Thank so much! I shall have to keep to this standard now! I would like a piece of humble cake and a diet free soda. Nice piece of work, well thought out and an artistic flurry. You are welcome. Being a cynic I eat tarts. But looking at your post put a smile on my face. Pretty good for a rainy day with only a dry wit and salt free potato chips at my side. This was so awesome! 🙂 Very creative! It is going to be extremely difficult to restrict myself to a single piece. Sweet post, clever idea! I really liked it. I would love to have a slice of that!! I’m sure it would be one happy fun real human… tried to reply in the same vein..;) nice post by the way. If i ever have to self examine my self…I’ll make a mess of it for sure…. people around me always tell me to “love myself” first before loving anybody else…its so hard… have always been so deprecating. I ‘m evolving ofcourse. Love this piece of yours. That sure makes an awesome, one of a kind, wonderful, amazing………… Priya. Good to see you in this light :). An awesome piece by the way ;). love your way of presenting recipes!! !